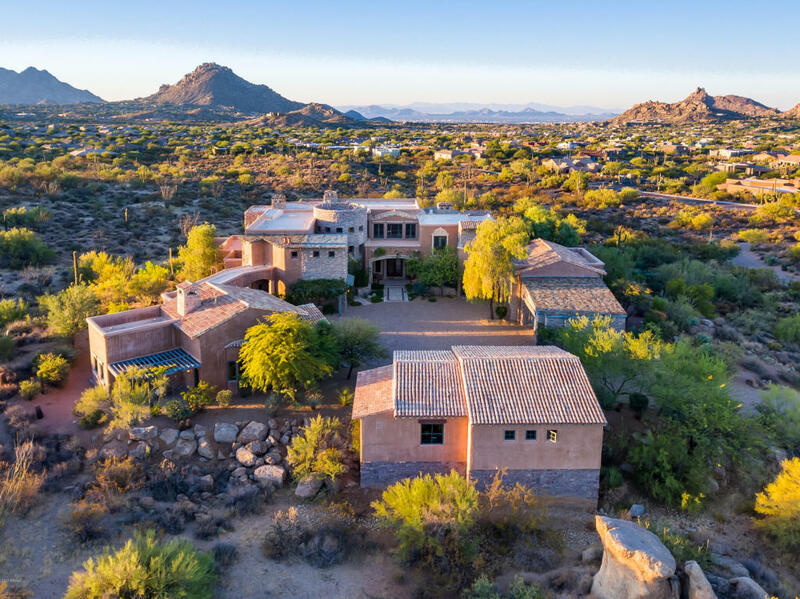 Privately Gated Estate right by Scottsdale National Golf Club, Car Collector 11 vehicle capacity garage within 2 climate controlled carriage homes all on a elevated lot with 360 degree panoramic views of sunsets, mountains and city lights. Multiple outdoor living and covered patios, separate 1,378 SF casita with living room and full kitchen; his and her offices, exercise room, elevator to master bedroom, climate controlled 2,000 bottle capacity wine/cigar room. Venetian plaster accents, mesquite planks, travertine and mosaic tile flooring, Granite counters, heated negative edge, pebble-tec spa and pool with waterfall, multiple gas fireplaces, Viking and SubZero appliances, full theater w/stadium seating, Crestron automation system. SEE VIDEO Additional Available 5 acres just to the South.